Ondine's CD release of three recent orchestral works by Magnus Lindberg is garnering top reviews in the international press. The recording includes Sculpture (2005), a work inspired by Frank Gehry's Walt Disney Concert Hall in Los Angeles, Concerto for orchestra (2003) and the horn concerto Campana in aria (1998). Sakari Oramo conducts the Finnish Radio Symphony Orchestra, joined by soloist Esa Tapani in the horn concerto (ODE 1124-2). The New York Times has listed the CD among their selection of the 22 most notable recordings of 2008, praising the, "dynamic readings from Sakari Oramo and the Finnish Radio Symphony (of) three recent harmonically vibrant and sonically adventurous works" (Vivien Schweitzer). David Hurwitz from ClassicsToday.com gave the recording a 10/10 accolade for both artistic and sound quality and called it, "a brilliant disc in all respects: performances, engineering, and above all, the music itself." Reviews in the U.K. have been equally enthusiastic: Geoff Brown from The Times praised "this sumptuous and teeming CD" as a proof that, "these days the (Finnish) country's classical musicians belong to the world's elite." Andrew Clements from The Guardian wrote on November 21 that, "this superbly played collection does include his two major orchestral achievements of the first half of the decade (which) are striking examples of Lindberg's recent style." 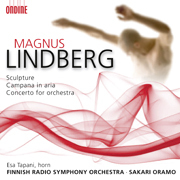 Paul Driver from The Sunday Times called Lindberg "a sort of supercomposer" (November 16). Matthew Rye included "this terrific disc" in The Daily Telegraph's listing of Classical Cds of the Week on November 8 and wrote, "Sakari Oramo and his superb Finnish orchestra give performances that can only be described as definitive." Finnish composer Magnus Lindberg, who celebrated his 50th birthday in 2008, is one of the most critically and popularly acclaimed composers in classical music today. Commissions from the world's top orchestras, such as The Philadelphia Orchestra and the Berlin Philharmonic, and his many recordings on Ondine and other major labels have helped to position him at the forefront of orchestral composition. His most prominent works include the concert-opener Feria (1997), large-scale orchestral statements such as Fresco (1997) and Cantigas (1999), and concertos for cello (1999) and for clarinet (2002). Energy, colour and a thrilling density of material are the hallmarks of Lindberg's recent style, and the works on this new recording offer entrancing examples thereof. This disc follows on from the great success of Kari Kriikku's recording of the Clarinet Concerto, which was awarded as the best contemporary / première recording at both the Gramophone Awards and the BBC Music Magazine Awards 2006 (ODE 1038-2). It also featured conductor Sakari Oramo and the Finnish RSO who are recognized experts in the field of their compatriot's music.